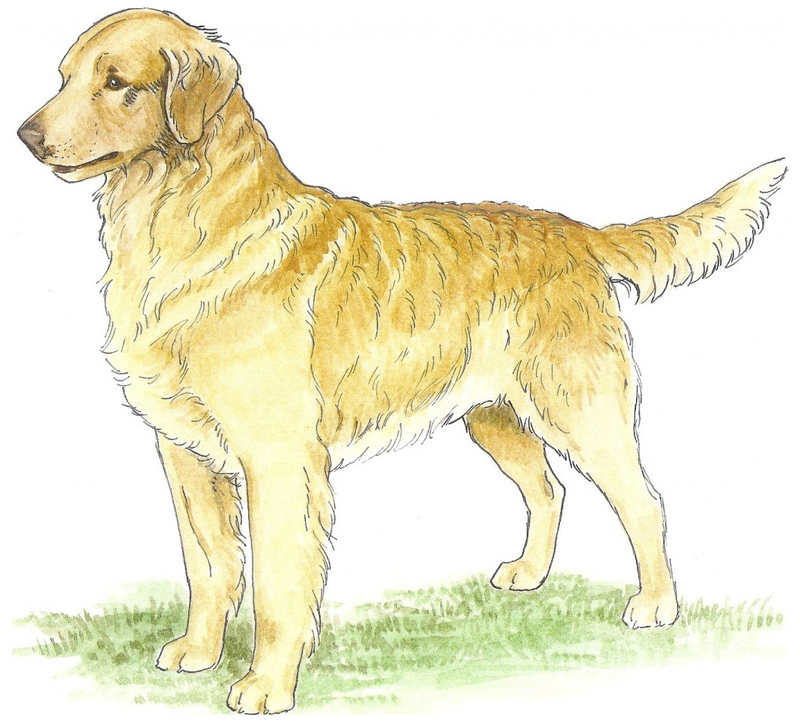 This image is of “Belle,” the Tweed water dog that was bred to “Nous,” the yellow wavy-coated retriever, to found the Lord Tweedmouth strain of yellow retrievers. The Tweed water dog, often referred to as a spaniel, was actually a dog that belonged to market hunters on the North Sea coast of England and southern Scotland– from Norfolk to the mouth of the River Tweed. These dogs were basically the equivalent of the Chesapeake Bay retriever in Britain. They were owned by men who shot ducks and geese (often with punt guns) and needed a boisterous water dog to collect their catch. They also would catch ducks during the molt, when they couldn’t fly. Along the rocky shores and dreadful declivities beyond the junction of the Tweed with the sea of Berwick, water-dogs have derived an addition of strength, from the experimental introduction of a cross with the Newfoundland dog, which has rendered them completely adequate to the arduous difficulties and diurnal perils in which they are systematically engaged. These stupendous and inaccessible cliffs and precipices are so favorable to the propagation of soland geese, sea-gulls, and wild fowl of every description, that the coast may be said to be covered with them, from one extremity of the northern district to the other, and the necessitous and laborious class entirely support themselves and families, during the greater part of the year, by patient attacks whenever there is a probability of success, (otherwise they never discharge a gun) and by the persevering exertions of their dogs. Those clifts, or recesses, are selected which, from their situation at certain angles, or points, afford the most promising expectations of success: in each of these, (but not at a less distance than one quarter, or the third of a mile from each other) huts are so curiously constructed with sods, intermixed with loam, marl, and other applicable articles, as to form, when finished, a seeming part of the rock itself. To each hut is a door, or shelf, within, for the convenience of depositing provisions and ammunition, as well as three circular openings of four inches diameter, (to the right, the left,and the centre,) for the discovery of the fowl on their approach, and the subsequent discharge of the gun, when they, fortunately, were within shot, but which is never discharged except the magnitude of the birds promises a profitable hit; the smaller tribe are permitted to pass unmolested. In this sequestered situation, remote from every human eye, accompanied only by his faithful dog, the adventurer takes his seat at the very dawn of day, his success depending more upon the fluctuating favor of the elements than upon any energetic endeavours of his own. This occupation (for by the happy and enlightened part of the world it cannot be termed a sport, or amusement,) requires more patience and philosophy than any other in which the dog and gun are conjunctively concerned (pg. 405-406). A very similar breed was bred in Ireland, which was called the Northern Irish water spaniel or “Irish retriever. 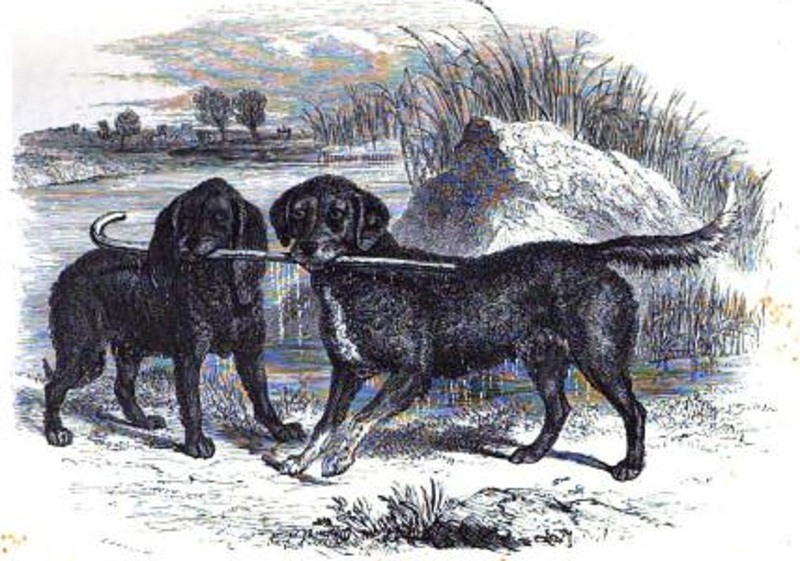 Unlike the nobles’ retrievers, which were almost always selected for black color, market hunters’ water dogs were selected to be camouflaged. Nobles were hunting with retrievers at a heel over game driven to them or pointed by non-retrieving pointers or setters, while market hunters were out in hides after truly wild birds that were flying over hides or boats. The Tweed water dog is also in the Labrador retriever. 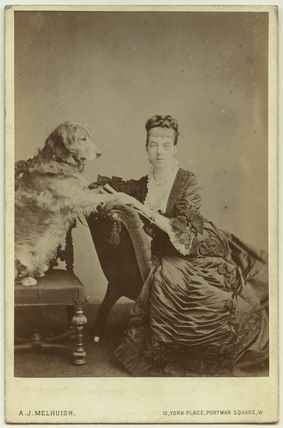 The Dukes of Buccleuch crossed their smooth retrievers with Tweed water dogs when it became too difficult to import water dogs from Newfoundland. They were also crossed into the standard curly-coated retriever, and there was at least one strain of yellow curly-coated retrievers, which may have descended from these dogs. I am glad that Marcia Schlehr, who is North America’s leading golden retriever historian, decided to do this depiction of Belle, and portrayed her as looking more like a retriever than a sort of mongrel Irish water spaniel. 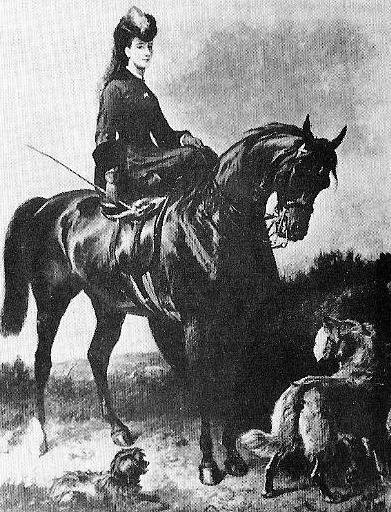 Elma Stonex, the golden retriever breeder whose research essentially debunked the Russian circus dog origin story for the breed, thought that John Carlton’s painting of a water spaniel was the closest thing to a Tweed water dog. But we know what the Nous and Belle puppies looked like. There were paintings and even photographs of them. They were yellow, and if you saw them today, you would think they were just regular golden retrievers. So it would make sense that Belle would look more like a retriever than an Irish water spaniel. Enjoyed your new post featuring Marcia’s drawing of Belle and the historical information about her breed. Very interesting. on February 8, 2015 at 4:40 pm M.R.S. I have encountered three or four Goldens over the years who had a distinctly “Chessie-like” coat; very firm to the touch with a pronounced short curl and that “waxed” feel, with a very dense undercoat. Wonderfully water-proof and resistant to burs,,mud, etc. Perhaps a “throwback” to the water dog ancestry. The analogy of Tweed water dog to Chesapeake is a good one, although I think perhaps the Tweed dog was a bit different in temperament. Joan Tudor had what she termed a “throwback” dog. It was rather large but it had a tight curly coat all over its body. When I last visited, she was a little disappointed that he was out of coat but I did have a chance to see him originally as a puppy.